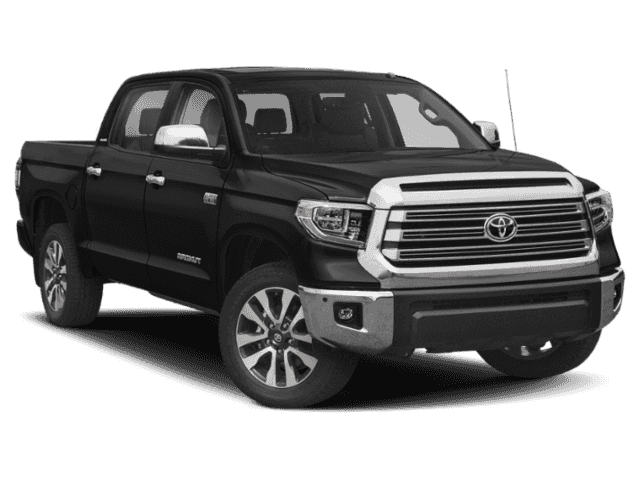 Those features just scratch the surface of the Tundra Limited’s enhanced capabilities. 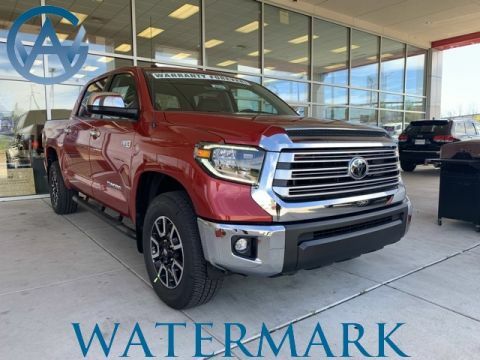 And when you need to stop on a dime, you’ll be happy that Edmunds found that, “Consistent, powerful braking is a Tundra strength.” Toyota’s premier pickup is available with multiple engines and body styles, so explore Watermark Toyota’s new Tundra Limited selection today. Tundra Limited, 4D Double Cab, 4WD, BLACK, Graphite Leather Seat Trim, TRD Off Road Package, Watermark's Warranty Forever, Bedside TRD Off Road Decal, Blind Spot Monitor w/Rear Cross Traffic Alert, Brushed Stainless Steel Stepboards, Color-Keyed Rear Bumper, Front & Rear Parking Assist Sonar, Glass Breakage Sensors (GBS), Illuminated Entry System, Leather Seat Trim w/TRD Off Road Package, LED Headlights w/Smoked Housings, Limited Premium Package, Power Windows w/Front Auto Up/Down, Trail-Tuned Bilstein Shock Absorbers, TRD Off Road Floor Mats, TRD Off Road Package, TRD Performance Dual Exhaust System, TRD Shift Knob, Wheels: 18" x 8J Split 5-Spoke TRD Off Road Alloy. 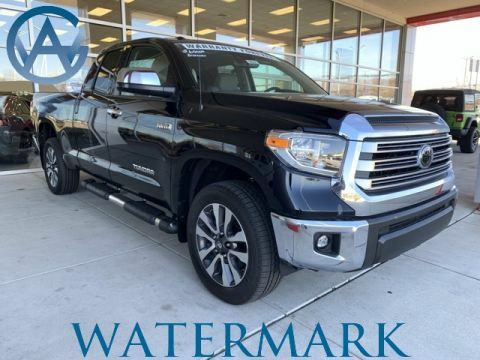 2018 Toyota Tundra Limited The Watermark Warranty Forever is valid for as long as you own the vehicle & for an unlimited time, unlimited miles. How much is it? Zero. We're building "Customers for Life" so the Watermark Warranty Forever comes standard with every qualifying vehicle meeting the criteria and is included at no extra charge. There are no catches, hidden fees, or gimmicks. Our dealership provides this product as an added value to our Customers for doing business with us. As part of the Toyota family, your exceptional ownership experience starts with ToyotaCare1, a no cost maintenance plan with 24-hour roadside assistance. The ToyotaCare plan covers normal factory scheduled maintenance for 2 years or 25,000 miles, whichever comes first. 24-hour roadside assistance is also included for 2 years and unlimited miles. 2018 Toyota Tundra Limited i-Force 4WD, Super White, Sand Beige Leather, Bedside TRD Off Road Decal, Blind Spot Monitor w/Rear Cross Traffic Alert, Color-Keyed Rear Bumper, Front & Rear Parking Assist Sonar, Glass Breakage Sensors (GBS), Illuminated Entry System, Leather Seat Trim w/TRD Off Road Package, LED Headlights w/Smoked Housings, Limited Premium Package, Power Windows w/Front Auto Up/Down, Trail-Tuned Bilstein Shock Absorbers, TRD Off Road Floor Mats, TRD Off Road Package, 5-Spoke TRD Off Road Alloy. As part of the Toyota family, your exceptional ownership experience starts with ToyotaCare1, a no cost maintenance plan with 24-hour roadside assistance. The ToyotaCare plan covers normal factory scheduled maintenance for 2 years or 25,000 miles, whichever comes first. 24-hour roadside assistance is also included for 2 years and unlimited miles. Tundra Limited CrewMax, i-Force 5.7L V8 DOHC 32V LEV, 6-Speed Automatic Electronic, 4WD, Barcelona Red Metallic, Black Leather, Watermark's Warranty Forever, Bluetooth Connection, Bedside TRD Off Road Decal, Blind Spot Monitor w/Rear Cross Traffic Alert, Color-Keyed Rear Bumper, Entune App Suite, Front & Rear Parking Assist Sonar, Glass Breakage Sensors (GBS), Illuminated Entry System, Leather Seat Trim w/TRD Off Road Package, LED Headlights w/Smoked Housings, Limited Premium Package, Navigation System, Power Windows w/Front Auto Up/Down, Radio: Entune Premium JBL Audio AM/FM/HD Radio/CD, SIRIUSXM Satellite Radio, Trail-Tuned Bilstein Shock Absorbers, TRD Off Road Floor Mats, TRD Off Road Package, Wheels: 18" x 8J Split 5-Spoke TRD Off Road Alloy. 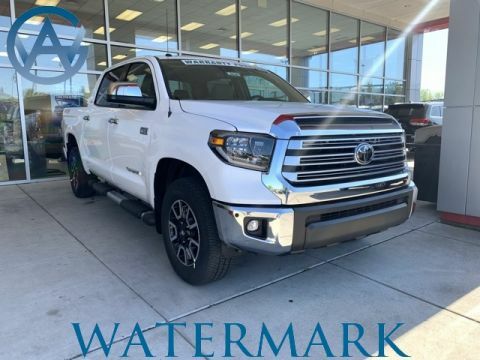 2019 Toyota Tundra Limited The Watermark Warranty Forever is valid for as long as you own the vehicle & for an unlimited time, unlimited miles. How much is it? Zero. We're building "Customers for Life" so the Watermark Warranty Forever comes standard with every qualifying vehicle meeting the criteria and is included at no extra charge. There are no catches, hidden fees, or gimmicks. Our dealership provides this product as an added value to our Customers for doing business with us. 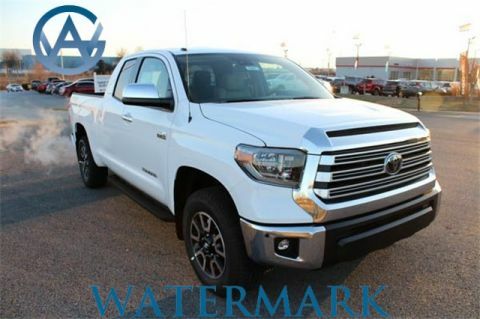 Why Buy a New Tundra Limited from Watermark Toyota? Located at 1055 Crossing Place in Madisonville, KY, Watermark Toyota is happy to show off our collection of Toyota trucks and SUVs. If you have any questions, feel free to give us a call at 270-821-3372, or schedule a test drive to experience V8 power today!